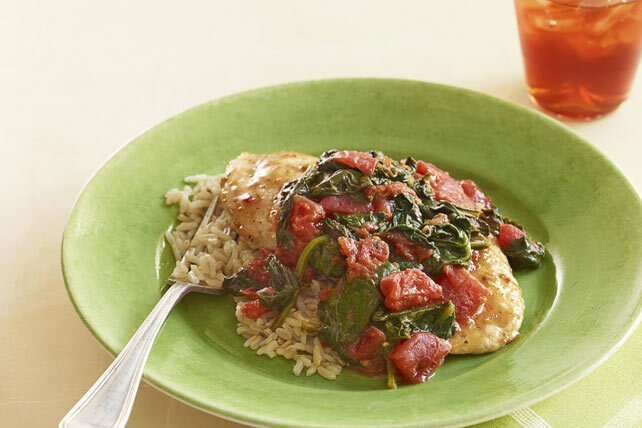 Chicken comes out extra tender after a skillet-simmer with diced tomatoes and spinach. They’ll never believe you made this main dish chicken recipe in minutes. Cut chicken breasts horizontally in half; pound to 1/4-inch thickness. Combine tomatoes and 3 Tbsp. dressing. Heat oil in large nonstick skillet on medium-high heat. Add chicken; cook 2 to 3 min. on each side or until done (170°F), drizzling with remaining dressing for the last minute. Transfer to platter; cover to keep warm. Add tomato mixture to skillet; bring just to boil, stirring frequently. Add spinach; cook on medium heat 2 to 3 min. or just until spinach starts to wilt, stirring constantly. Spoon spinach mixture over chicken. Serve with rice. Place chicken breasts, 1 at a time, between 2 sheets of plastic wrap, then pound to desired thickness. Since this easy-to-make meal provides a good source of calcium, it can be part of a healthful eating plan.